All-Time Snowfall Records Fall Across Western Oregon & SW Washington | Watts Up With That? Vancouver, Washington (March 22nd 2012) – “Many cities across Western Oregon and Southwest Washington are setting all-time cold and snowfall records for this late in the season. Since Tuesday night, the Willamette Valley has been blanketed with anywhere from 2″ to 9″ of snow from Vancouver, WA. south to Eugene, Oregon. “The Portland International Airport recorded 0.5″ of snowfall overnight last night which sets a new all-time record for that location. March 22nd 2012 will now go down in the record books as the latest measurable snowfall in Portland Airport history. The period of record at the Portland airport is 1940-2012. The previous latest snowfall on record for the Portland airport was set on March 15th 1946. The excellent staff at the Portland office of the National Weather Service have reviewed daily records that previously indicated both March 20th 1995 and March 25th 1965 as the latest dates for measurable snowfall in Portland. WILL BE ONE THAT LOCAL RESIDENTS WILL NOT SOON FORGET. OVER THE HIGHER HILLS OF THE METRO AREA. THIS IS A RECORD LATEST MEASURED SNOWFALL AT THE AIRPORT. THESE EVENTS WERE SMALL HAIL ACCUMULATIONS. ON AVERAGE...PORTLAND AIRPORT RECEIVES 0.2 INCH OF SNOW IN MARCH. CITY OF EUGENE...  6 TO 10 INCHES...HEAVIEST IN SOUTH HILLS. SNOWFALLS OF THE WINTER SEASON (WITH STORM TOTALS). ON AVERAGE...EUGENE RECEIVES 0.5 INCH OF SNOW IN MARCH. RECORDS FOR EUGENE DATE BACK TO 1892. WITH THE HIGHEST AMOUNTS ON THE HILLS IN SOUTH SALEM. LATE SNOWFALLS OF THE WINTER SEASON (WITH STORM TOTALS). ON AVERAGE...SALEM RECEIVES 0.3 INCH OF SNOW IN MARCH. RECORDS FOR SALEM DATE BACK TO 1892. And here in southern New England we’re hitting 80 degrees with little spring rain. Does this mean more snow melt and runn off that will be diverted away from the irrigation farming? OK, but this won’t make the MSNBC front page. Too inconvenient. Wow! Two to nine inches of global warming! La Nina started work about six weeks late this winter, so she needs six weeks at the end to finish her job. Memo to Mother Nature: It’s spring darn it! What’s this white stuff on my flowers? The good news is that the jet stream has shifted back north to the US-Canada border, where it continues on up towards Labrador. Perhaps that will help moderate the weather in the west. Meanwhile, thanks to that jet stream, Buffalo yesterday had an all time high for the month of March of 82°F. We’ve already had a string of over 10 days of above 60°F high temps, compared to the normal high temp of approx 45°F. Of course, since this is just weather, there’s nothing to prevent the jet stream from developing another wiggle and sending us a blast of cold air and two feet of snow for Easter Sunday. Global cooling is a threat to our way of life. Children are just never going to experience what it was like before snow days!!! Here in in Western Canada we have so much snow (Great skiing /snow boarding) that last night the Government put out a flood advisory for the spring melt off. The snow amount and depth is very similar to the 1970s on the coast mountain range. I drove home in a pretty good flurry last night. I’m at 300 feet elevation. Had over an inch on the ground this morning! Had my anti-lock breaks kick in entering the parking lot at work. Looks like a lot of people are tele-commuting today. Had an inch of wet snow on the ground at 6:00am this morning. Still have snow in the shaded areas of the lawn at 11:00am. Located near Fairwood WA, between Renton and Maple Valley, at 560 ft feet above mean sea level. (I’m ‘down’ today, with an incredibly sore throat.) Outside temp 39F, calm, with broken overcast. We have had far more snowfall days here this winter than I have experienced in the 14 years I have lived here. Over the last 3 weeks, we’ve had snowfalls on 2 – 3 days each week. We are averaging 10F below normal temps for much of February and all of March, so far. The extended forecast says we may hit low 50F next week for daily highs, when average daily highs for this time of year have been high 50’s. I’ll believe it when I feel it! Areas of the Cascades (Mt. Baker, Snoqualmie Pass, etc) have recorded huge snow fall totals over the last 3 weeks. Mt. Baker is reporting +15 feet for March 1 – 20. The average of both poles’ global sea ice area is still increasing and rising above the 1979-2008 mean. I have been calculating the sea ice areas as a percent above or below the 79-08 mean for both poles and averaging them to get a single number. The number is currently increasing. This could be a quick glance indicator to show total ice stability related to the average. This just can’t be happening, I have watched the weather channel and saw nothing on record cold or snow. In fact they had a fancy graphic on TV and spent 2 minutes talking about… ‘potential record highs’. Meanwhile in Atlanta, GA we’ve had a very mild winter. The temperature was over 80F (27C) for the St. Patrick’s Day parade March 17th. I’m not used to weather this nice for St. Pat’s (great crown turnout BTW). On the other hand, we just set an all-time high for pollen count this last Monday: over 8,000! (for tree pollen, anything over 1,500 is ranked “very high”). Make that “great crowd turnout” above — as far as I know there were no members of the royal family in attendance, but we did have the consul general for Ireland. Ha! . . living here in Salem, Oregon I can tell you that we had five inches of “potential record highs” last night. In case you’re wondering, “potential record highs” happen to be bright white and cover the ground quite nicely. I live on a hill at about 400 feet elevation in Salem; this morning about 4 am it was incredibly beautiful with the street lights reflecting off the snow and lighting up the low layer clouds. According to weather.com, over 4,300 record highs have been compiled in March, and nt small ones — by eight to ten degrees. Any plans for a post about this? So, was it the low amount of arctic ice which caused this snow? ‘Cause last I checked we’re right at an 7-8 year high in extent. According to the BEST QC data (latest release) Portland Airport has been cooling since around 1988. On the other hand, you had 30C on the east coast a few days ago – in freakin’ March, or so the story goes on German news. Don’t you know ANYTHING? This is exactly what you’d expect to see with global warming! Duh. … Of course, since this is just weather, there’s nothing to prevent the jet stream from developing another wiggle and sending us a blast of cold air and two feet of snow for Easter Sunday. In fact, the whole west coast (according to BEST) has been cooling since around 1983 … which is when a slight majority of stations went to cooling. The trend is even colder as you look at later years. Ignore first link, doesn’t work. The interesting part of temp records at the Portland OR and Vancouver WA airports is they get a lot of influence from the Columbia River water temp. and the Columbia Gorge wind pattern temp. influence. TV stations here cover a wide range of lesser stations and each will try to predict the weather with use of several models each with a different conclusions. It is always fun living in a area with such a busy weather pattern. Yes interesting. Water is almost everywhere. 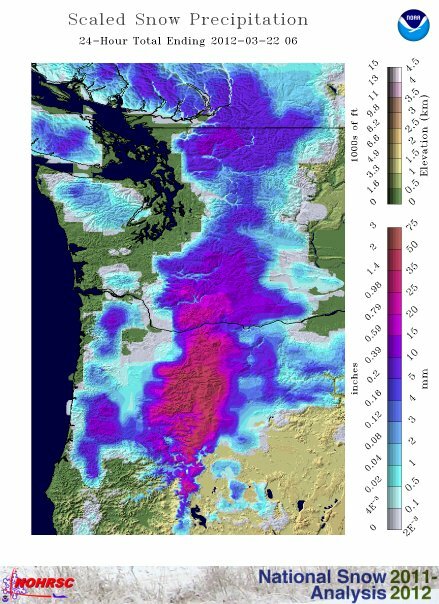 Here in Portland the snow has just about vanished (maybe the warmers got out here and made it go away) but in the mountains the Snotels http://www.or.nrcs.usda.gov/snow/maps/oregon_sitemap.html show us creeping above last years incredibly high snow fall amounts. Last year we couldn’t get into the high country until late August because of the large amounts of snow. I see the ENSO meter is swinging back towards neutral – I just wish someone would tell the tropical “monsoon” that has settled in over northern Australia and decided to vacation in the coastal areas around Brisbane this week. And, finally, in a news story about electricity price increases someone actually admitted the summers of 2009/10 and 2010/11 were the two coldest for Brisbane recorded for so long they had forgotten it could be this cool and wet in summer. Yesterday we had more than four inches of rain in an hour – yes an hour- this in the middle of a few days or more of steady rain. I know mother nature has to wash that pollutant out of the air but this is getting ridiculous. I want to know what you make of it. Sorry – 2010/11 and 2011/12 – 2009/10 was warmer than the last 2 but was the beginning of the breaking of the 2000’s drought and saw the first significant dam filling rains for nearly 10 years – from 65% in a few months. GOES West (GOES 15) went into safe mode after the 2030 UTC image on 3/21/2012 so there is no good satellite image for the west coast right now. NOAA is busy trying to get it working again. Ahahahaha! Too funny. 40 times as many warm records as cold records, daily low temperatures exceeding the previous record high, and you think it’s “normal”!! Has Dr. David “Childrenjustwontknowwhatsnowis” Viner heard about this white stuff? Must be a pigment ouf your imagination, Anthony. All that cheap hydroelectric power from this water will have to be burned off to allow for expensive wind and solar to be moved on the grid. I woke up Wednesday to 6 inches of really wet and heavy snow. Every single plum tree around had its branches broken. Sme oak tree limbs lost theirs as well. The awning over my hot tub is broken. And I was without power for about 18 hours. It was insane. Apologize for the formatting, the important numbers are the last 2 in each line. We rely upon snow for much of our water in the west, and the snowpack has been low most of the season. The penultimate number is the percent of average water equivalent, the last is percent of average annual precipitation. Names are basins in Oregon, and data is as of March 22, 2012. So yes, the extra snow we’ve been getting later winter to early spring is much appreciated. In the mid 70’s, we drove through a snow storm in NE Oregon (elevation about 3600′). The date? July 4th. I’ll have to check, but this would mean that there was no ice in the Arctic…and there should be record highs all over the planet. On the other hand, CO2 was lower then so…that must have caused it…low CO2. Right? Right? Right? Slightly off topic but I think still relevant, Has anyone noticed that only the NORSEX graphs on the sea ice reference pages now show the grey standard deviations. I’m sure that before the recent period they were shown so that everyone was given the impression that they were really low, now that they are within these boundaries, they have been removed to give the impression that they are still below the standard levels! If my memory is faulty, apologies. Some of that cold and snow showed up at Kennewick Washington early this morning.This is in some of the warmest area of eastern Washington. This is the latest snowiest (3/4″) day on record and that means something because the last time it was about that snowy for march was March 12 1974 and then it was One inch on the ground.The high yesterday was only about 41 degrees and that is TWENTY degrees below the average high for the data. Is there a website that is tracking all time record “extreme AGW weather” comments? Climate disruption as expected. Global warming as predicted..
Al Baby must be happy! Another $100 Million in the bank account! But they will say snow is global warming. And unfortunately, there are people that will believe them. All those inches of global warming are impossible , can not be happening at least from the coverage on CBC. Instead we are bequeathed such wisdom as;Its an unprecedented high temperature none this high since 1946. This is what a liberal arts education from a Canadian university will do for you ? Do you have any idea how large the natural temperature range is for most states the U.S.? Normal high temps in the month of March range from 50-58 deg F, all time record high for the month 84 degrees on 3/26/1971. Record low max temperature 6 deg F set in 1920 and 1948. Normal low temps for the month ranges from 22 to 30 deg F, All time record low -11 degrees on 3/28/1886. That gives us a total temperature envelope of 95 deg F for the month of march. The all time record low is 33 deg F below the typical low temperatures, the record high is 26 degrees F above the typical high range. During periods where the jet stream loops high over the mid-continental U.S. and allows warm air to intrude far north, 2/3 or more of the country can have above average temperatures (ie your high number or record highs). By the same token, when the Jet stream loops in the other direction the entire eastern 2/3 of the country can be plunged into arctic temperatures during a spring cold out break. I’ve seen high temperatures of 79 deg F in December, and we have had record low temps of 42 deg F on July 4th here. The same applies for most any part of the country you care to examine the weather records for. The only thing unusual about the high temperatures is you have not seen enough weather to know that this sort of thing happens all the time. The earth has been cooling since 1998. So I suppose record high temps—a thing that always happens whether the earth is in a cooling or a warming trend—are the only thing some global warming believers have to cling to as their boat goes down. I didn’t see them talking much about ice covered citrus fruit in Florida for two years in a row as record cold temperatures were happening across the Northern Hemisphere. Wife reports that 30 miles south of Portland we had 3 inches of snow last night, with school’s closed and the neighborhood turned into a winter wonderland for children. I wouldn’t know as I am in Sacramento area visiting the parents and enjoyed a nice 70 degree day. I had the pleasure of driving from Burns, in the high Oregon desert, to Eugene Wednesday, while the storm was in full progress. When I left Burns at 10 am, it was in the balmy 40s (Burns got 4″ of snow on Tuesday, all gone by that evening). The SW wind across the desert was really pushing my SUV around. My wife called me while I was “resting” at the Brothers Oasis to tell me Santiam Pass had been closed by a landslide and two snow related accidents. So, I headed through Bend to Willamette Pass to Cross the Cascades. What interested me so much about this storm that while Santiam Pass had received about 2 feet of snow by noon Wednesday noon, Willamette Pass, a mere 54 air miles to the south had nothing but rain. It rained just about the entire way from Bend to Eugene. I guess the amount of “global warming” that falls on the ground depends on what side of the front you’re on. 😉 It was an interesting storm, that’s for sure. King 5 weather says we may get one little high 50’s spike this Sat, my day off. It better happen, damnit. I’ve been standing in front of my BBQ in flip flops with beer and burger in hand pretending it is warm all freakin winter long! My fantasy is wearing thin! Sorry to change gears on you fine folks but has anyone seen any long term summer predictions due to the current La Nina? Curious as to what summer holds in store. Last thing we need is record breaking heat to pump up the Alarmist crowd. Arkansas has had a very nice mild (but wet) winter! Hope summer is mild as well! Oh, by the way, I spent the last three winters in Afghanistan. I found all the missing cold from across the US this winter. Apparently the Warmist’s are trying to hide the cold in remote third world locations! It was misreable here! We’ve had a wonderful, mild winter here in Southern New England. Yesterday was near 70 with lots of people on the beach. Global Warming: What’s to hate? I am still a little wary, though. I can vividly remember driving in the snow during the Easter Sunday blizzard of 1970. Anthony, I’d like to see you take on his analysis. Do you agree? why or why not? Do you have a different analysis? I am also very interested to see Anthony’s take on the Jeff Masters’ analysis of the heat wave. It seems to me that 5 straight days of 80+ temperatures in the middle of March across the northern Midwest is so far outside the range of “normal” climate that it a site dedicated to “puzzling things in nature, science, weather and climate change” would want to evaluate it. You can be fairly certain that with March’s heat wave this will be the warmest winter on record in a good chunk of the USA (and Canada). I don’t see how that is not worth remarking on if you profess to be a climate scientist. I thought I would add that Masters’ post today describes the March heat wave as “one of North America’s most extraordinary weather events in recorded history. ” I should think that a blog on climate and weather would want to discuss such an event. About 10 days ago when earlier March records were broken, I stated that if you wanted to forecast this and other “extremes” like droughts in Texas, floods…… just look at weather reports of about 60 years ago. One commenter from the NW said he hoped not because he was born about that time and they apparently had the coldest snowiest weather over a long stretch. While the present stretch still seems to be stretching, just like it did 60 years ago. The cold should carry on for a while yet. Note that the Norwegian (Nansen Arctic Roos) ice area has crossed the “climatology” curve. Also the Danish Meteorological Institute graph of ice extent in WUWT’s Sea Ice resource (header above) is the highest in years – also crossing the “line”. Cryosphere Today is still on the stingy side. NSIDC is set to cross the line but is also on the stingy side. Who are you going to trust: the Norwegians who have sailed and trudged all over the ice for a few hundred years in both polar regions, or the Universities of Global Warming. edu.